A little known fact of my life: when I was 5 my parent decided to vacation in Florida for the first time, and they picked the later half of October for this family outing. Of course, when I was 5 the year was 1962, and if you do a quick search on The Google you’ll discover in the last half of October, 1962, Florida was probably the last place in the world you wanted to be, since the odds of experiencing a live reenactment of Alas, Babylon, were pretty high. Now, I remember none of this, but my parent often told me the story of how, right in the middle of the stuff about to go down, they decided the place to hang was a motel in Clearwater, Florida, which is about a 10 mile jaunt across Old Tampa Bay from MacDill AFB, a huge Strategic Air Command base and, at that moment in time, a target that was going to get whacked out in short order should the Cuban Missile Crisis have decided to go hot. Oh, yeah, I heard all the stories about how my parents couldn’t sleep because B-52s were taking off and landing non-stop throughout the night, and, of course, the thoughts that the next breath you took was going to be the last. So why stay there when the ends seemed neigh? Because my mother was of the opinion that if there was going to be a War (and we’re talkin’ a goin’ toe-to-toe with the Ruskies type of war, man), might as well be close to a location that was gonna take a 10 megaton blast that was gonna kill everyone within 10 miles of Ground Zero in a matter of seconds. Hey, it was the middle of the Cold War. That’s how you thought. Apocalyptic Bebop (The Nails came across my radio stream this morning, sorry) has always been big. Look at the books; look at the movies. And look at the games. There are no shortages of RPGs where players get to be the survivors of some long-ago wipe out of civilization who spend their days living off the corpse of the old world, nibbling at the scraps that remain clinging to the skeleton that was Mankind. Darwin’s World is one such RPG. 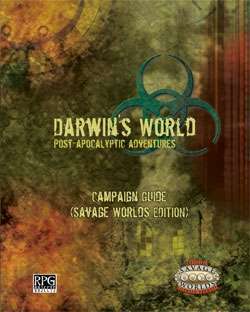 Its been around in one form or another since 2001, and now, here, we have a version of Darwin’s World Campaign Guide for the Savage Worlds system–and, it would seem, all is fine in the world. After the End of the World as We Knew It, Twisted Earth (as it is called) has become a place of death and destruction, with people hanging on by a thread, radiated mutated animals and humans roaming the wilderness lookin’ to take down a morsel to get them by until their next big feeding–oh, and robots left over by “The Ancients” (that would be us and who blew it all to hell, and didn’t even have the decency to leave behind a Stargate) that may or may not be of the killer or Cherry 2000 variety; you just have to walk up to them and see. 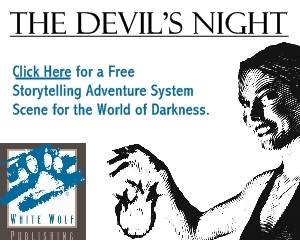 Whereas the original version was D20 OGL, the version here is based upon the Savage Worlds system. If you are not familiar with Savage Worlds, you should make yourself, because when it comes to a nice, neat, quick game system, it is hard to do better. To break it down fast: your character has Traits (which are Attributes, Skills and Derived Stats), Edges and Hindrances; they buy gear and have a background. That’s pretty much it for the PC. The Attributes and Skills are dice level based, with the lowest level being a d4, followed by d6, d8, and up. No Trait go beyond a d12, but Edges can allow your final result to fly higher A die can Ace: roll the highest number possible on that die and you roll again, adding up the number(s) as you go. And you have a few extra points known as “bennies” that you can use to keep from being wounded and changing outcomes if need be. And the “Wild Cards” (AKA, PCs) get a few advantages that the “mooks” (AKA cannon fodder) don’t, like having Extras (AKA Allies, Assistants or Side Kicks) that are actually able to lend the PC a helping hand. You take this, throw into the blender that is Twisted Earth, and you’re gonna have more fun than the Humongous can shake a stick at. The book goes into great detail concerning the makeup of the world, mostly paying attention to how “civilization” is set up these days, the different factions one might encounter, the mutated creatures that may and will eat your face if you’re not careful–and robots, who seem to be a bigger problem than one might imagine for a Mad Max-style world at some point down the time line from us. 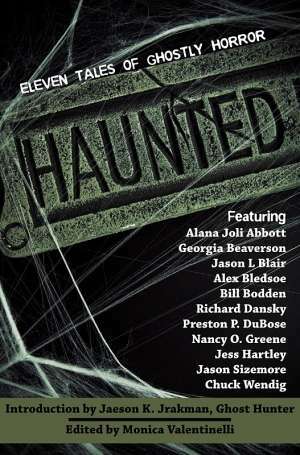 The book has it all, particularly a very detailed section on gear–the kind you might own or what you might scavenge. Or what you might be killed for, given the current situation for the game world. However, the meatiness of the Campaign Guide is such that even if you didn’t play this using Savage Worlds, you have plenty of material here to reference and use elsewhere. The section on Vaults (pre-Fall “secured locations”, most underground or in mountains) makes for interesting reading, and may make one curious enough to look around for information on the subject. And there is the elements that most games of this nature go into which–namely drugs and slavery. There are slavers in the game; in fact, being a member of a faction that deals in slaves is very doable. And drugs ranging from marijuana to crack, acid and heroin are used commonly enough that your character is gonna get a contact high as they stroll around Bartertown. Sure, you don’t need to have either of these elements in a game about the suffering found in an irradiated hell brought about by your great-great-grandparent, but, hey, if you need to kick out the jams and get the world just a little more Twisted, go for it. If you, as a GM, enjoy running your players through Hell, then the Twisted Earth is a great place to plop them down and make them beg for mercy. (And, no: Duffy’s not included.) And if you, as a Player, love the idea of spending your days wandering the Wastelands looking for some clean water, you’ve got it in aces, my friend. Either way, if unrelenting dismay and wretchedness are what you look for in your apocalyptic game, you’ve come to the right place.